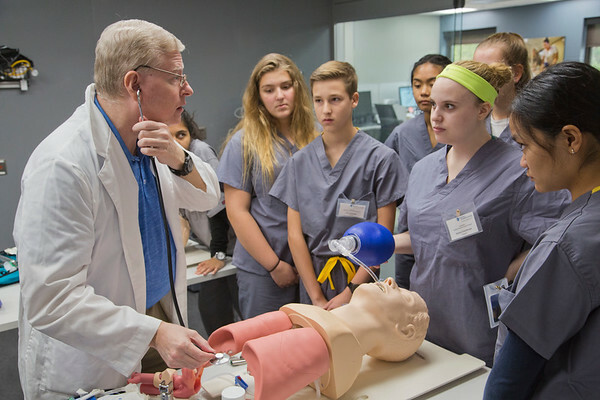 The Healthcare Careers Discovery Program offers an innovative, simulation-based approach for high school students aspiring to a career in the evolving field of healthcare. The active learning environment includes a combination of classroom and simulation learning experiences to introduce the student to various clinical professions and skills. American Heart Association CPR/AED and First Aid Certification are included. Returning students are matched with providers in their field of interest to observe these professionals. Roundtable discussions and presentations allow participants to share their knowledge. Simulated patient encounters require the students to respond to emergent situations and promote teamwork. New skills are introduced with hands-on demonstrations, including a special suturing workshop. As a take-away from the program, each participant records a professionally produced, personalized scholarship video showcasing his/her participation in the program and projecting his/her future potential in health care.